Go for a change of pace with the rugged-chic Chancey tall boot. 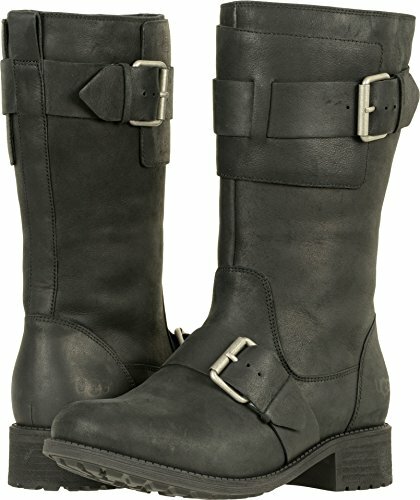 Water-resistant leather uppers with leather straps and buckle details. Partial medial side zipper closure for an easy on-and-off. Soft and cozy UGGpure™ wool linings. PORON® and foam cushioned insole is lined with UGGpure™ wool for all-day warmth and comfort. Leather-stacked heel. Rubber outsole. Imported. Measurements: Heel Height: 1 1⁄4 in Weight: 1 lb 6 oz Shaft: 10 in Product measurements were taken using size 7, width B - Medium. Please note that measurements may vary by size. Weight of footwear is based on a single item, not a pair. PORON® and foam cushioned insole is lined with UGGpure™ wool for all-day warmth and comfort. Leather-stacked heel. Rubber outsole. Imported. Measurements: Heel Height: 1 1⁄4 in Weight: 1 lb 6 oz Shaft: 10 in Product measurements were taken using size 7, width B - Medium. Please note that measurements may vary by size. Weight of footwear is based on a single item, not a pair.